In an industry filled with copycat bands, it’s really hard to stand out and get noticed. DC’s Fight The Lion are attempting to do just that. Having just released their full length CD, “When The Mighty Fall”, they are winning over audiences with their great live show and a fresh batch of catchy songs off of their CD. The guys have seen a lot happen in a short time. They have opened for such acts as Cheap Trick, Def Leppard, Poison, Candlebox and Lifehouse while touring up and down the East coast. A sponsorship with Jagermeister, two EPS, a name change and a few personnel changes later, the guys are really to solidify their place in music industry. The band, consisting of Jake Mimikos on guitar and lead vocals, Ron Cruz on lead guitar and vocals, Shawn Battle on drums and vocals and Jason Proctor on bass, seems to be defining their sound on this CD. Tracks seem to bounce back and forth between uptempo rockers such as “Runaway Lover” and “The Drive” to slower, more emotionally charged songs such as “A New Hope” and “The Changing”. On the slower tracks, Jake has almost a Michael Stipeish (REM) quality to his vocal delivery. You can really feel the emotional attachment to the lyrics of the slower songs by Jake. The title track, “When The Mighty Fall” is a standout on the CD and sets the tone of the overall positive message that the band is conveying to the listener, focusing on the positive and overcoming negativity. This does seem to be the overall theme to the CD. Ron has really stepped up his game on this CD, yet at times it seems as if he is holding back. The band’s live show really gives him a chance to flex his muscles. Shawn really puts in a solid performance laying down some thunderous rhythms on the disc. Jason, newest addition to the band, shows that he is a worthy addition as his bass provides a pounding back beat that compliments Shawn’s drumming to create a worthy rhythm section. “When The Mighty Fall” is a great progression for this young band. Their songwriting on this CD has matured a great deal since their two EPs. 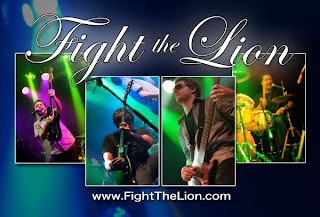 For fans of modern and progressive rock, I would highly recommend checking out Fight The Lion. In a world of wannabees, these guys show a lot of promise and drive that will soon make them the ones to be.